Are you looking for fun things for kids to do in Northwest Arkansas? You are in luck, in addition to the 88 items listed, there are also other events that occur on a weekly or monthly basis. For example, Bentonville and Fayetteville have charming town squares featuring many lively scheduled events, April – December. Eureka Springs, Rogers, Springdale and Siloam Springs also offer enjoyable fairs or festivals in their downtown areas throughout the year. Of course, for sports lovers, you can’t beat the excitement of calling the hogs at Arkansas Razorback games or watching Arkansas Naturals games, as well as other special events. Fund your upcoming summer travels by listing your home with Airbnb. Click here to find out what you could earn. Below is a listing of things to do that kids will enjoy throughout Northwest Arkansas. 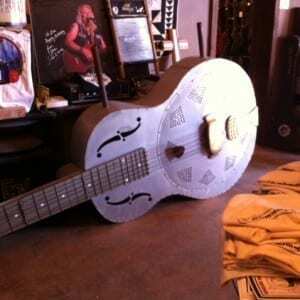 Meteor Guitar Gallery – Vintage guitar and music history museum. Walmart Museum – World-class exhibit gallery highlighting the history of Walmart and The Spark Café Soda Fountain. 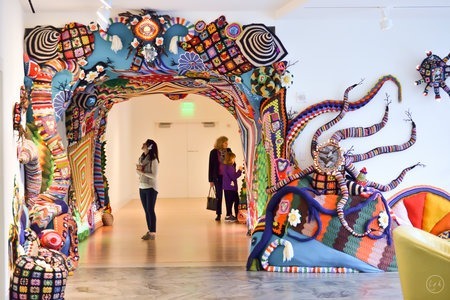 The Amazeum – hands-on, interactive museum for children and families. Walking/Cycling Trails – Bentonville has a number of very pleasant parks with beautiful walking trails and playgrounds for the kiddos. Intrigue Theater – Magical demonstrations, feats of astonishing mental capabilities, and other inexplicable mysteries. Ghost Tours ~ Crescent Hotels hosts popular Ghost Tours. Quigley’s Castle – Listed in the National Register of Historic Places, the Quigley’s Castle is completely made from stone, out of a woman’s desire to have her own home. The gardens are credited with approximately 30 species of flowers. Eureka Springs Gardens – One mile of garden trails at the Blue Spring Heritage Center. Eureka Springs Trolley Service – Trolley service to various locations throughout town. Ozarks Mountain Zipline – A 2-hour canopy tour, billed as the largest zipline and the highest cables in Arkansas. The New Great Passion Play – Outdoor drama of the last days of Christ’s life. Dinner Bell Ranch and Resort – Guided tours from a one hour ride to an all-day excursion on horseback. In addition a Saddle and Paddle adventure is available, an hour-long ride followed by a seven-mile canoe float. Steve’s Stable at Pond Mountain Lodge – One-hour guided trail tour with six riders or less. Hidden Valley Ranch Stables – Horseback riding on the 650 wilderness acres of this guest ranch. Rent a horse or bring your own. Bear Mountain Riding Stable – Hour-long rides with incredible views of the surrounding hills. 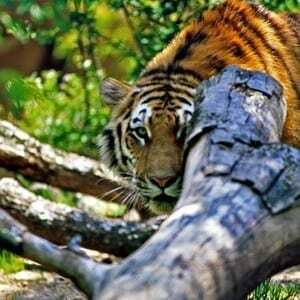 Turpentine Creek Wildlife Refuge – Turpentine Creek is a non-profit organization that provides lifetime refuge for abandoned, abused, and neglected “Big Cats”. Belle of the Ozarks – A 12 mile cruise on Beaver Lake. Cosmic Cavern – View two underground lakes in one of the Ozarks prettiest caves. Harmon Park – City park with playground equipment and a cement skate park. 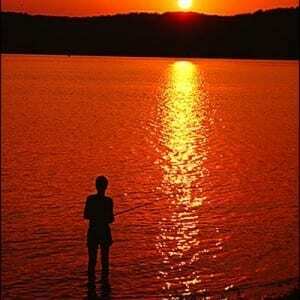 Lake Leatherwood Park – 1,600 beautiful acres of Ozark mountain countryside with something for everyone to enjoy. Includes an 85-acre lake to swim, fish, paddle or simply to sit and gaze upon; and there are 20+miles of maintained trails for cycling or hiking. Onyx Cave Park – Take a 30-minute self-guided tour of Onyx Cave. SUP Outfitters – Stand-up Paddle-boarding on Beaver Lake. Withrow Springs State Park – Features a spring flowing from a small cave, and a creek that runs through the park. Picnic areas, swimming pool, campsites, and hiking trails are available. Arkadia Retrocade– Nearly 130 vintage arcade games that feature an array of classic games like Pac Man as well as newer games like Mortal Kombat. The arcade offers unlimited play for a set price. Regal Fiesta Square 16 – A movie multiplex that screens primarily first-run Hollywood movies. Starlight Skatium – A 10,000 square-foot, hardwood skating rink, snack bar and plenty of seating. Terra Studios – A glass art studio and gallery that is famous for its handcrafted glass Bluebirds of Happiness. TheatreSquared – A professional theatre that is locally produced and provides nationally acclaimed production. Walton Arts Center – Arkansas’ premier center for performing arts and entertainment. Arkansas Air and Military Museum – Colorful history of aviation in Arkansas through numerous displays of original artifacts and aviation memorabilia. Clinton House Museum – Fayetteville’s first home of Bill and Hillary Clinton. 112 Drive-In Theatre – A drive-in movie theatre that offers first-run Hollywood movies and a delightful concession stand. Open late spring and summer months with shows times over the weekend evenings. Lokomotion Fun Park – A family-fun entertainment park that includes bumper boats, arcade, go karts, miniature golf and laser tag. Ozark Bowling – A bowling alley with 40 synthetic bowling lanes. 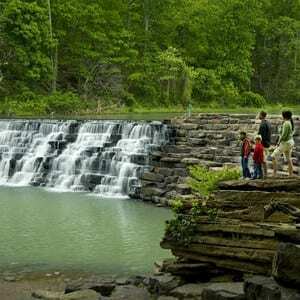 Buffalo River – The First National River, is located 119 miles out of Fayetteville, it is a popular camping, canoeing, swimming, hiking and fishing destination. Devil’s Den – A picturesque Arkansas State Park nestled Lee Creek Valley. Camping, fishing, canoeing, kayaking, mountain biking and pedal boating are available. Lake Fayetteville – A 640 acre city park, offers many recreational opportunities—boating, fishing, softball, volleyball, hiking, mountain biking and picnicking. Botanical Garden of the Ozarks – The park is located on 86 acres adjoining Lake Fayetteville. It includes 12 themed gardens and a butterfly house. Lake Wedington – A 102 acre lake and 424 acre red area are popular for swimming, canoeing, picnicking, hiking, biking, and horseback riding. Mulberry Mountain – 39 miles from Fayetteville, Mulberry Mountain offers cabins, campgrounds, ATV trails, canoeing, hiking, fishing and more in the beautiful Arkansas Ozark Mountains! Wilson Park – A park that features a small castle and a gazebo. This popular park can be used for baseball, basketball, tennis and volleyball and has a swimming pool, walking trail and playground. Lowell Historical Museum – Rich history of Lowell. Fast Lane Entertainment – A family entertainment center, that includes 22 bowling lanes, a laser tag arena, go-karts, arcade and a ball blaster system. Golf Mountain – The business offers 36 miniature golf holes. Wild Wilderness Safari – A 400-acre park that is home to exotic and domestic animals — big cats and rhinos, farm animals and birds. There is a convenient drive-through section that is 4 miles long and includes a petting parks as well as walk-through areas. Rogers Bowling Center – Offers 28 lanes of bowling with shoe rental. Rogers Aquatics Center – A 3 acre water park provides a variety of water activities including the bucket dump, lazy river and sand volleyball court as well as swim competitions. High Rise Extreme Air Sports – Ultimate Trampoline Park and Extreme Air Sports Center. Pinnacle Hills Cinema – Malco Theatres – 12 screen theatre showing first run movies. Rogers Splash Park – 10 in-ground sprinklers, 2 Moveable water cannons and playground. Rogers Towne Cinema – Malco Theatre showing first run movies. Daisy Airgun Museum – The Daisy museum displays an expanded collection of airguns, antique furnishings, posters, postcards, photos, letters, advertisements, catalogs, promotional materials, and World War II items. Walmart AMP – The top Arkansas live music venue – get your tickets here. Hobbs State Park – A park filled with woodland hiking and biking trails. Pea Ridge National Military Park – Civil War battlefield that includes self-guided tours and a bookstore. War Eagle Mill – A working grist mill that grinds corn and wheat daily. 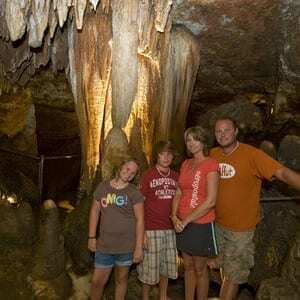 War Eagle Cavern – Spectacular cavern located between Rogers and Eureka Springs. Visitors enjoy guided tours, panning for gems, scenic picnic spots and miles of hiking trails. Community Bowl – A bowling alley with 16 different lanes, an arcade and a snack bar. Siloam Springs 6 – A six screen movie theatre that shows primarily first run Hollywood movies. Siloam Springs Museum Society – A historical museum that seeks to educate visitors about the history of the local area. Dogwood Junction – Unique bike shop that rents bikes and surrey bikes (covered, four wheeled type). Be sure to order a surrey ride with picnic in the park, and they provide the table cloth/blanket, picnic basket and food from local eateries. Jones Center – Premier facility for recreation, learning, community events, and parties. Springdale Bowling Center – Bowling alley that offers full service dinner too. Sunset Cinema 9 – A 9 screen theatre discount movie theater, that shows second-run movies. Kyya Chocolate – Kamp Kyya – teaches kids how to make chocolate. Shiloh Museum of Ozark History – A regional history museum focusing on the Northwest Arkansas Ozarks. Arkansas and Missouri Railroad – This 8-hour scenic tour through the Boston Mountains that includes a two and a half hour stay in Historical Van Buren, where you can enjoy shopping at over 80 stores and dine at several fine restaurants. 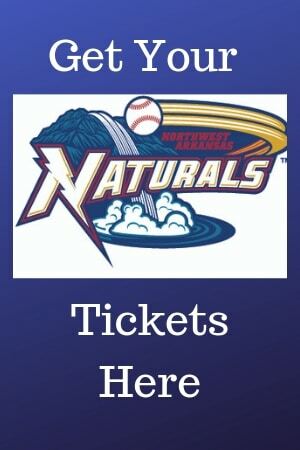 Arkansas Naturals @ Arvest BallPark – A minor league team of the Kansas City Royals. – Get your tickets HERE. Farmland Adventures – (Only open weekends Sept -Nov ) 9 acre giant corn maze, pumpkin patch, pony rides, petting zoo, pig race and kid’s play area. Fun City Pizza – Pizza, arcade games and miniature golf. Ozark Climbing Gym – A climbing gym that offers a rock climbing experience without the use of ropes or safety harnesses. Guests of all climbing levels are offered a safe environment to climb..
Rodeo of the Ozarks – A professional rodeo June 27th- June 30th, 2018. Please let us know if there are additional things to do for kids and families in the Northwest Arkansas area.